The fundamentals of gorgeous, manageable, healthy -looking tresses conveniently packed in our Holiday exclusive MONAT Toiletry Bag. Grab these 6 travel- size, travel-friendly hair essentials and always be ready to go any time, any place, anywhere. The perfect gift this year is making “travel hair” look great. A salt and sulfate-free gentle, hydrating cleanser that penetrates and moisturizes the scalp. A complete 1 step process that gently cleanses and conditions the hair. A gentle cleanser that helps to provide a healthy environment to support natural hair density. KEY INGREDIENTS: PROCATALINE™, CAPIXYL™, REJUVENIQE®, CRODASORB™. INGREDIENTS: Water (Aqua), Lauramidopropyl Betaine, Sodium C14-16 Olefin Sulfonate, Sodium Methyl Cocoyl Taurate, Sodium Cocoamphoacetate, Cinnamidopropyltrimonium Chloride, Stearyldimoniumhydroxypropyl Decylglucosides Chloride, Fragrance (Parfum), Guar Hydroxypropyltrimonium Chloride, Pisum Sativum (Pea) Extract, Acetyl Tetrapeptide-3, Trifolium Pratense (Clover) Flower Extract, Limnanthes Alba (Meadowfoam) Seed Oil, Crambe Abyssinica Seed Oil, Camellia Oleifera Seed Oil, Solanum Lycopersicum (Tomato) Seed Oil, Daucus Carota Sativa (Carrot) Seed Oil, Citrus Limon (Lemon) Peel Oil, Citrus Aurantifolia (Lime) Oil, Citrus Aurantium Bergamia (Bergamot) Fruit Oil, Adansonia Digitata Oil, Mauritia Flexuosa Fruit Oil, Cocos Nucifera (Coconut) Oil, Gardenia Tahitensis Flower Extract, Moringa Oleifera Seed Oil, Caryocar Brasiliense Fruit Oil, Helianthus Annuus (Sunflower) Seed Oil, Glycerin, Dextran, Citric Acid, Cocamidopropyl Hydroxysultaine, Propanediol, Glycol Distearate, Sodium Hydroxypropylphosphate Decylglucoside Crosspolymer, Lauramide MIPA, Sodium Hydroxypropylphosphate Laurylglucoside Crosspolymer, Cocamidopropyl Betaine, Butylene Glycol, Amodimethicone, Trideceth-12, Cetrimonium Chloride, Benzoic Acid, Caprylyl Glycol, Benzyl Alcohol. INGREDIENTS: Water, Lauramidopropyl Betaine, Sodium C14-16 Olefin Sulfonate, Guar Hydroxypropyltrimonium Chloride, Acrylates Copolymer, Sodium Methyl Cocoyl Taurate, Sodium Cocoamphoacetate, Amodimethicone Stearyldimoniumhydroxypropyl Decylglucosides Chloride, Pisum Sativum (Pea) Extract, Acetyl Tetrapeptide-3, Trifolium Pratense (Clover) Flower Extract, Limnanthes Alba (Meadowfoam) Seed Oil, Crambe Abyssinica Seed Oil, Camellia Oleifera Seed Oil, Solanum Lycopersicum (Tomato) Seed Oil, Daucus Carota Sativa (Carrot) Seed Oil, Citrus Limon (Lemon) Peel Oil,Citrus Aurantifolia (Lime) Oil, Citrus Aurantium Bergamia (Bergamot) Fruit Oil, Adansonia Digitata Oil, Mauritia Flexuosa Fruit Oil, Cocos Nucifera (Coconut) Oil, Gardenia Tahitensis Flower Extract, Moringa Oleifera Seed Oil, Caryocar Brasiliense Fruit Oil, Helianthus Annuus (Sunflower) Seed Oil, Mentha Piperita (Peppermint) Oil, Mentha Arvensis Leaf Oil, Eucalyptus Globulus Leaf Oil, Mentha Viridis (Spearmint) Leaf Oil, Thymus Vulgaris (Thyme) Oil, Lavandula Angustifolia (Lavender) Oil, Citrus Medica Limonum (Lemon) Peel Oil, Glycerin, Tocopherol, Menthol, Cinnamidopropyltrimonium Chloride, Dextran, Propanediol, Glycol Distearate, Sodium Hydroxypropylphosphate Decylglucoside Crosspolymer, Lauramide MIPA, Sodium Hydroxypropylphosphate Laurylglucoside Crosspolymer, Cocamidopropyl Betaine, Butylene Glycol, Oleth-5 Phosphate, Dioleyl Phosphate, Cocamidopropyl Hydroxysultaine, Citric Acid, Trideceth-12, Cetrimonium Chloride, Aminomethyl Propanol, Phenethyl Alcohol, Undecyl Alcohol, Benzyl Alcohol. INGREDIENTS: Water, Sodium Lauroyl Methyl Isethionate, Lauramidopropyl Betaine, Sodium Cocoyl Isethionate, Polyquaternium-7, Glycol Distearate, Glycereth-26, Cetearyl Alcohol, Pisum Sativum (Pea) Extract, Acetyl Tetrapeptide-3, Trifolium Pratense (Clover) Flower Extract, Limnanthes Alba (Meadowfoam) Seed Oil, Crambe Abyssinica Seed Oil, Camellia Oleifera Seed Oil, Solanum Lycopersicum (Tomato) Seed Oil, Daucus Carota Sativa (Carrot) Seed Oil, Citrus Limon (Lemon) Peel Oil, Citrus Aurantifolia (Lime) Oil, Citrus Aurantium Bergamia (Bergamot) Fruit Oil, Adansonia Digitata Oil, Mauritia Flexuosa Fruit Oil, Cocos Nucifera (Coconut) Oil, Gardenia Taitensis Flower Extract, Moringa Oleifera Seed Oil, Caryocar Brasiliense Fruit Oil, Helianthus Annuus (Sunflower) Seed Oil, Mentha Piperita (Peppermint) Oil, Rosmarinus Officinalis (Rosemary) Leaf Oil, Glycerin, Cinnamidopropyltrimonium Chloride, Dextran, Butylene Glycol, Citric Acid, Vanillyl Butyl Ether, Polyquaternium-10, Disodium EDTA, Benzyl Alcohol, Caprylyl Glycol, Benzoic Acid. A rich conditioner that stimulates and helps to support healthy hair density. A rich hydrating masque for damaged and moisture-starved hair. KEY INGREDIENTS: REJUVENIQE®, Agrana Rice Starch, Organic Sugar Cane Alcohol. INGREDIENTS: Tetrafluoropropene, Alcohol Denat, Oryza Sativa (Rice) Starch, Quaternium-90 Sepiolite, Isopropyl Myristate, Fragrance, Limnanthes Alba (Meadowfoam) Seed Oil, Crambe Abyssinica Seed Oil, Cocos Nucifera (Coconut) Oil, Camellia Oleifera Seed Oil, Solanum Lycopersicum (Tomato) Seed Oil, Daucus Carota Sativa (Carrot) Seed Oil, Citrus Medica Limonum (Lemon) Peel Oil, Citrus Aurantifolia (Lime) Oil, Citrus Aurantium Bergamia (Bergamot) Fruit Oil, Adansonia Digitata Oil, Mauritia Flexuosa Fruit Oil, Gardenia Taitensis Flower Extract, Moringa Oleifera Seed Oil, Caryocar Brasiliense Fruit Oil, Helianthus Annuus (Sunflower) Seed Oil, Cetrimonium Chloride, Quaternium-90 Montmorillonite. KEY INGREDIENTS: Wavemax, Capixyl, Procataline, Crodasorb, REJUVENIQE®, Peppermint Oil, Rosemary Oil. INGREDIENTS: Water, Cetearyl Alcohol, Isoamyl Laurate, Behentrimonium Chloride, Linum Usitatissimum (Linseed) Seed Extract, Glycerin, Stearamidopropyl Dimethylamine, Pisum Sativum (Pea) Extract, Acetyl Tetrapeptide-3, Trifolium Pratense (Clover) Flower Extract, Limnanthes Alba (Meadowfoam) Seed Oil, Crambe Abyssinica Seed Oil, Camellia Oleifera Seed Oil, Solanum Lycopersicum (Tomato) Seed Oil, Daucus Carota Sativa (Carrot) Seed Oil, Citrus Medica Limonum (Lemon) Peel Oil, Citru Aurantifolia (Lime) Oil, Citrus Aurantium Bergamia (Bergamot) Fruit Oil, Adansonia Digitata Oil, Mauritia Flexuosa Fruit Oil, Cocos Nucifera (Coconut) Oil, Gardenia Taitensis Flower Extract, Moringa Oleifera Seed Oil, Caryocar Brasiliense Fruit Oil, Helianthus Annuus (Sunflower) Seed Oil, Mentha Piperita (Peppermint) Oil, Rosmarinus Officinalis (Rosemary) Leaf Oil, Salvia Hispanica Seed Extract, Tocopherol, Cinnamidopropyltrimonium Chloride, Dextran, Butylene Glycol, Citric Acid, Benzyl Alcohol, Ethylhexylglycerin. INGREDIENTS: Water, Cetearyl Alcohol, Cetyl Esters, Cinnamidopropyltrimonium Chloride, Behentrimonium Chloride, Pisum Sativum (Pea) Extract, Acetyl Tetrapeptide-3, Trifolium Pratense (Clover) Flower Extract, Limnanthes Alba (Meadowfoam) Seed Oil, Crambe Abyssinica Seed Oil, Camellia Oleifera Seed Oil, Solanum Lycopersicum (Tomato) Seed Oil, Daucus Carota Sativa (Carrot) Seed Oil, Citrus Limon (Lemon) Peel Oil, Citrus Aurantifolia (Lime) Oil, Citrus Aurantium Bergamia (Bergamot) Fruit Oil, Adansonia Digitata Oil, Mauritia Flexuosa Fruit Oil, Cocos Nucifera (Coconut) Oil, Gardenia Tahitensis Flower Extract, Moringa Oleifera Seed Oil, Caryocar Brasiliense Fruit Oil, Helianthus Annuus (Sunflower) Seed Oil, Glycerin, Dextran, Fragrance, Cetrimonium Chloride, Butylene Glycol, Amodimethicone, Trideceth-12, Dehydroacetic Acid, Benzyl Alcohol. 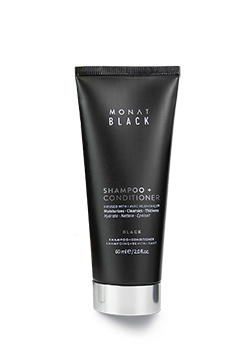 MONAT Black Shampoo + Conditioner- Emulsify in hands and apply to hair. Leave on 2 minutes. Rinse and repeat. Can be used daily, or as frequently as you normally shampoo. 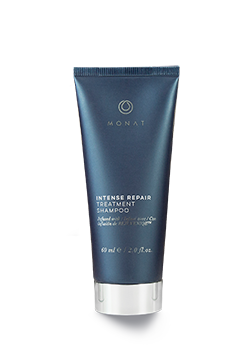 Intense Repair Shampoo- Emulsify in hands and apply to hair. Leave on 2 minutes. Rinse and repeat. Can be used daily, or as frequently as you normally shampoo. The CHAMP Conditioning Dry Shampoo- Hold 8-12 inches away from hair and spray as needed. Can be blowdried into hair for volume. 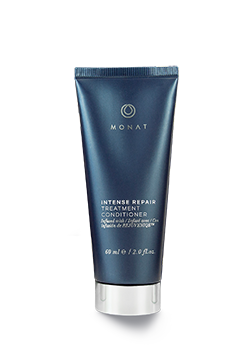 Intense Repair Conditioner- After shampooing apply to hair, leave on 5 min, then rinse. Replenish Masque- After shampooing apply to hair and leave on 5 minutes. Use 1-2x a week or every 3rd shampoo if you shampoo infrequently. Follow with Restore Leave in Conditioner.